1) L'OREAL PARIS SUBLIME SUN POWDER: A compact sunscreen that comes in only one universal shade, ideal to use instead of the usual liquid foundation. The texture is very light, smooth and water-resistant; helps to keep the skin matte and protected during the day. 2) L'OREAL PARIS INFALLIBLE MEGA GLOSS N. 402: A gorgeous liquid lipstick with a great matte finish. This shade went soon sold out since is the most beautiful, at least for me. Together with the Sublime Sun, I just love it and, in fact, I'm using it every day. 3) PHILIPPE MATIGNON ONE-PIECE SWIMSUIT: This is my last purchase, luckily found 40 % off. One-pieces are very trendy this summer and I think is a good investment during the sales, the whole price is usually pretty high for just a swimwear, don't you think? I hope to find another one in red too. Voglio provare la Sun powder di L"Oreal! That swimsuit has such a great classic look to it and it's awesome you were able to get it on sale. I saw a few one pieces I liked on sale but they were all out of my size. I have never heard of popcorn flavored Tic Tacs but you have me so curious now. i will have to see if I can find them here. Happy weekend dear Lilli! Hope you are doing well!!!!! Le Tic Tac al pop corn?!?! Dove? Come? Quando? Perché io non le ho ancora viste?!?! Le voglio! Si, e anche il costume. Mi piace un sacco! I'll need to look out for the L'Oreal Sun Powder, had no idea that they have something like this in their range. And the liquid lipstick sounds lovely too...I am soooo going shopping this weekend. LOL! I like the red gloss! I don't know the Sun Powder and the popcorn flavored Tic Tacs !! Have a wonderful weekend dear!Enjoy!Hugs! Quante belle cose! Un bacio Lilli. Hello, the L'Oreal products looks fabulous. They will definitely charm. But I'm not so sure about the popcorn tic tacs. I hope you enjoy the weekend. L'Oreal gloss has an amazing shade of red! I also like the swimsuit! Thanks for this nice presentation, cara mia! Baci e abbraci! I've not heard of that favour of Tic Tacs before. Must try! I think I saw your lovely swimsuit on your Instagram. A one piece in black like this one is so elegant and stylish! Have a great weekend. 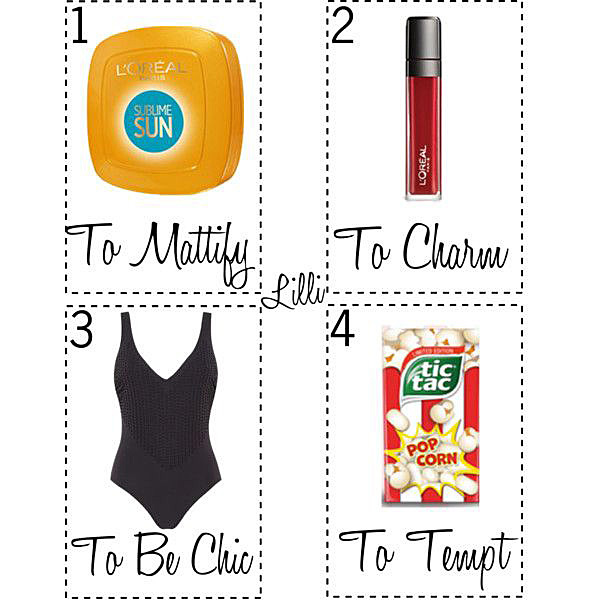 I would love to try the tic tac!! It sounds interesting!! Happy weekend Lilli!! The bathing suit looks classy. And I had never seen tic tac popcorn. Dear Lilli, I love your new swimsuit, I loved it as soon as you showed it to us on IG! It's amazing and I just know that it looks amazing on your great body! Non avevo ancora visto quelle tic tac, devo averle!! La cipria l'orla m'incuriosisce molto..
oh wow! popcorn flavored tic tacs! that's so cool. Popcorn ticking sounds fun, I like your new swimwear, looks very elegant! I love this classic swimsuit, just a timeless classic! Have a great week ahead, dear!